This course represents the culmination of the Aura-Soma Colour-Care System Training. It is a very deep and profound course as it explores the relationship between the Aura-Soma Equilibrium bottles and the Tree of Life and it furthers examines the single bottles of the Aura-soma Master sequence. Colour theory in relation to consciousness evolution as revealed by the unfolding sequence of the Master bottles. The colour combination bottles in relation to the Tree of Life and the Tarot. 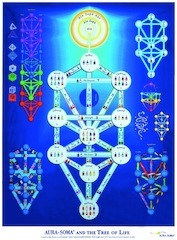 The Aura-Soma interface with the Kabbalistic Tree of Life. An introduction to mind mapping. Consultation Skills through awareness of the Practitioner, client and observer role. Revision and consolidation of information from previous levels.